Martin Sonka cleared into the track for the last run of the day. Sonka's first run put a clear margin between the Czech pilot and the rest of the team... he's looking calm and in control... aggressive flying and a little mistake there for Sonka in Gate 6... a little slip up there and a lack in focus in the descent gate but we might be seeing a more relaxed Sonka in this second run. VERY, very happy for Nicolas IVANOFF and his 4th place ! Good morning, Indianapolis! 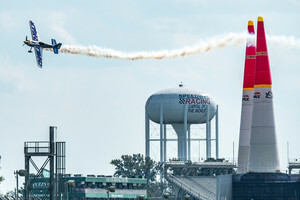 Welcome to Race Day here at the Indianapolis Motor Speedway, where the Challengers and Masters will be testing their mettle above the iconic motorsports location later today. Coming up at 11:45am local time, we've got the Challenger Cup. 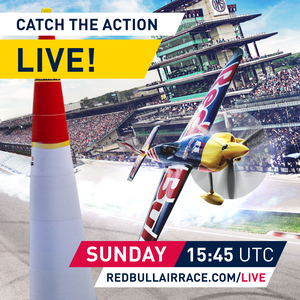 Then we'll be joining the Master Class LIVE from 13:00 local time, for the penultimate Round of 14 here in Indy. Will the Challanger Series be aired on the live stream? GO Pat!! Not long to wait now until the Challengers go full throttle in the Challenger Cup... it was Patrick Davidson who clocked in fastest in yesterday's Challenger Qualifying session, closely followed by Florian Berger who was just 0.059s behind the South African pilot. Due to illness, Kenny Chiang will not participate in the Challenger Cup today. He will be evaluated Did Not Start (DNS) and will always be ranked 7th during this sporting event. See statement below regarding Kenny Chiang's participation today. Weather looking more settled than yesterday... the wind has swung around to the south but is only around 6kts. A little lighter than yesterday so we might see some tighter, faster racing lines out there today. Hello everyone! 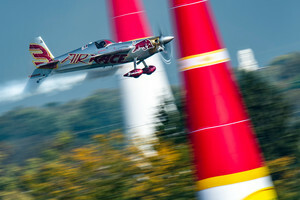 Have fun, enjoy the race cheering your favourite pilots! Next up it's Kevin Coleman. He's into the track at 132kts through the State Gate. Cleanly through the first gates and he's already 0.5s faster than Genevey. Building momentum now... yesterday's Qualifying was not good for Coleman who picked up a myriad of penalties but so far we're seeing some pretty steady flying from the American. He's risen to the challenge and both the VTMs are solid... picking up pace now in the back of the track... the margin is pretty substantial and Coleman pushes on through the last long bend... good, tidy racing lines there and he's put in his best performance of the week by far! A great finish for Coleman! 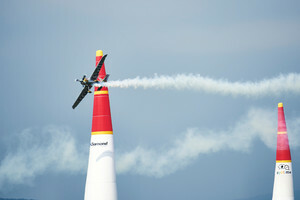 That puts Coleman firmly in first place, and he's actually flown faster than Berger and Davidson in those more unsettled conditions yesterday. 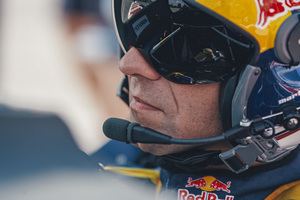 And Baptiste Vignes is next up... he's a bit of a dark horse as the French pilot is very capable of scoring a podium finish... he's into the track but at 127kts it's a little on the slow side.... yet he's only 0.092s off the pace in the first splits. Vignes looking very neat and the VTM looks a little conservative there but we're seeing reasonable pace and very clean racing lines right now. 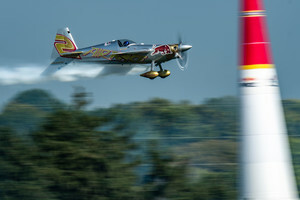 Coleman retain the lead and no penalties from Vignes... it's a great display of discipline and precision.... error-free flying from the French pilot, a great time for him personally but not enough pace to threaten Coleman's race win. Vignes slips into second place. Possibly Coleman's biggest adversary is Florian Berger... Berger into the track now... he's got the aggression and pace to take the win and the first splits are looking good despite a slight error in the VTM... the splits are green and Berger is taking some tight and quick lines... the conditions are perfect out there today and Berger is on the money right now... a little high in Gate 16 but we've seen no real errors from the German pilot... and he's done it! Berger has taken the win out of Coleman's grasp! Next up it's Patrick Davidson, who clocked in fastest in Qualifying yesterday. Davidson into the track and a slight wobble there... he's into the track at 133kts... he seems to be back on his racing lines right now, and good, solid VTM there. 0.029s in the first split and onto the second VTM.... great lines and easy flying but the pace needs to pick up now... Davidson squeezing the Edge for some extra speed out there and Davidson can't quite match his prowess from yesterday's Qualifying as he takes up third place overall so far. 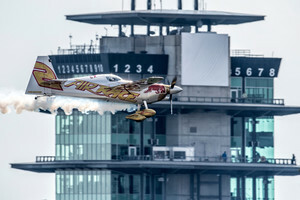 And here we go... the last Challenger to go airborne here in Indianapolis... and Dario Costa is into the track! Costa through the Start Gate at 146kts... he's quickly through Gate 2, a little ahead of the curve but the splits are looking quite slow right now... a slight rock in the VTM, but it's pretty clean flying. No penalties as yet, and Costa will need to find some more pace. The second VTM is a little scrappy, and he's picked up some more time. It doesn't look like he's finding enough speed out of the engine to grab a podium... it's good, clean flying and Costa finishes up in 5th place overall as he clocks in over 2s slower than winner Berger. At least all 6 Challengers stayed mistake free!